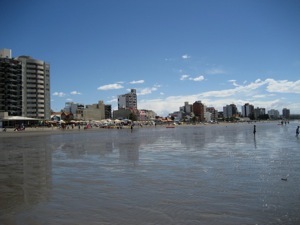 Puerto Madryn is the town of Peninsula Valdes and is considered the go-to spot for shopping, dining, business, night-life, or any other sort of city comfort. The town is made up of approximately 60,000 inhabitants and is said to be one of the fastest growing towns in Patagonia. It is lined with beautiful beaches and the Golfo Nuevo in the background where locals and tourists alike come together to take advantage of the beautiful location. As your eye follows the board walk south, you will see where the town comes to an end. This point is a popular gathering ground for those looking to relax and admire the whales performing in the sea beyond. Just a few steps beyond you will arrive at El Ecocentro. There’ll gain a whole new perspective on the whales, sea lions, penguins, seals, and other such animals. The Ecocenter is not only a beautiful building and observation point, but also an educational and cultural foundation dedicated to the preservation of the animals, land, and sea. It is a must-see destination within the city. El EcoCentro in Puerto Madryn – Whales, Penguins and Seals…Oh my! This page rendered in 0.445 seconds.